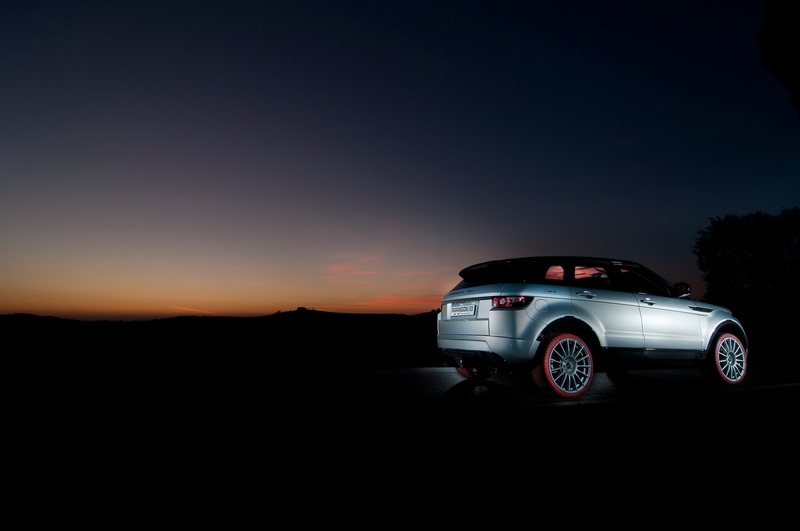 Marangoni Tyre, the manufacturer of ‘100% Made in Italy’ car tyres, has continued to communicate its focus on research, the environment and sport through for the fifth consecutive year by transforming the desirable Range Rover Evoque into a breath taking demonstration car – a project of style. • Elegance, fashion and sport, combined with friendliness to the environment, define the Marangoni Evoque HFI-R, the Italian tyre manufacturer’s latest show car. 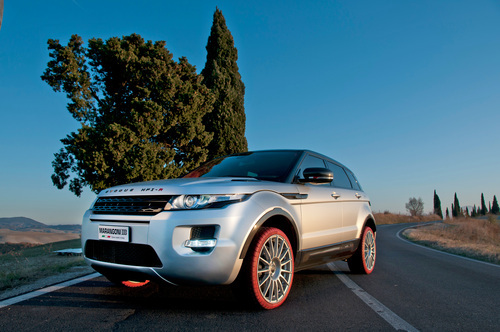 • The Marangoni Evoque HFI-R will be previewed at the upcoming Motor Show in Bologna (Italy), from 3 to 11 December 2011. • Marangoni has developed ‘M-Power EvoRed’, a special set of 20” ruby red coloured tyres, especially for this new show car. Taking unarguable Italian style to improve on car that has already gained fans across the world is a challenge that reflects Marangoni’s desire to continuously test design perceptions and to explore and search for ultimate production solutions. Marangoni Tyre has chosen the leading Italian motoring event, Bologna Motor Show, to present its new 2012 show car. The result of this style project is called Marangoni Evoque HFI-R, the quintessence of elegance, fashion and sport. Based on a Si4 2.0 Turbo petrol engine model, the Marangoni Evoque HFI-R has been tuned to deliver an additional 59bhp (total 300bhp), whilst still managing to significantly reduce fuel consumption and harmful emissions by exploiting innovative combined hydrogen and natural gas technology. The HFI (Hybrid Fuel Injection) system can either be supplied with hydrogen-natural gas mixes in varying percentages, or natural gas only, making it a valid 'ecological' and 'economical' solution, as these fuels do not pollute and are easy to source. For this demonstration car, Marangoni has developed ‘M-Power EvoRed’ - a special set of 20” ruby red coloured tyres. In this experimental version, the compounds used feature high silica content along with innovative materials that minimise rolling resistance and consequently fuel consumption – further enhancing the car’s economy credentials. Developed by utilising the same platform as the Marangoni tyre M-Power range, the EvoRed tyres represent a bespoke version of the new ultra high performance product from Marangoni. The Marangoni M-Power range is the result of considerable investments in technology and research that have allowed Marangoni to develop a product with a sporting soul, extremely high performance and progressive handling, designed to ensure maximum driving pleasure and the highest level of safety. M-Power, and the full Marangoni Tyre range are available exclusively throughout the UK at Kwik Fit. Complimenting the new design is the car’s stunning interior, provided by the very-Italian fashion brand Conte of Florence, which gives the car a sporting and at the same time elegant soul, in perfect symbiosis with the style of the specially developed sportswear. The Marangoni Evoque HFI-R is once again a worlds first – a reinterpretation of one of the newest cars to market. The design project was managed, as in the past, by the TRC Italia style centre, under the guidance of Simone Neri. HFI technology developed by Bigas International - more than 40 years experience and focus in the use of alternative energy sources. • Fitted with an ‘HFI’ Hybrid Fuel Injection dual-fuel engine. • Can use the original petrol engine or alternatively a mixture of hydrogen and natural gas from a separate tank. • Car has a range of 1,000 km when both tanks are full. • The system features a special pressure reducer called the RI27J, and a control unit that ensures both the safety and reliability that the use of hydrogen requires. • The system completely eliminates fine particle emissions and reduces CO2 emissions by the same percentage as the hydrogen contained in the mix, even exceeding 30%. • The final stage of trials, performed by Bigas International in collaboration with the Department of Energy at the Florence University Engineering Faculty, included analysis of all aspects relating to safety and pollution standards in force, after testing the effectiveness of the solutions adopted on a prototype. • Conte of Florence have applied special ‘quilting” to the car’s upholstery in an attempt to evoke the golfing traditions. • The large embroidered brand recalls the Tour Line logo, worn with pride by the brand’s sponsored golfers in official competitions. • The diamond patterns with double stitching, along with the design and colours used in the HFI-R reflect some of the themes of the Conte of Florence 2011-12 Autumn-Winter collection, available at more than 80 single-brand stores and around 800 multi-brand stores in Italy and abroad. • The bodywork of the car has been completely repainted. • Main body of the car uses a special paint, the latest invention by German company Fashion Paint, called Titanium Fluid Metal. This has a very fine grain that when combined with 100% matte clear coat offers tones of satin aluminium that change effect based on light exposure, with sensational results. • Front bumper has been redesigned, making the bottom centre intake wider, typical of more sporting cars. • Bottom door mouldings also have a more distinctive design. • Rear bumper has been completely modified, removing the two evident rear fog lights on the sides and adding a carbon fibre diffuser. • Carbon has also been used to make the wheel arches, the air intakes in the wheel wells, the boot handle, all the bottom door guards and the mirror covers. The latter also feature small Italian flags that continue the line of the integrated side indicators. • Certain parts, such as the front grill, the air intakes on the bonnet and door handles, have been painted gloss black to create contrast with the matte titanium body. • Engine power now reaches 300bhp, a good 59bhp more than the original version, with powerful delivery even at low revs. • Larger stainless steel exhaust complete with 200 cell metal catalyst. • Engine air intake has also been modified using a specially designed carbon air box. • Already powerful standard braking system has been replaced with innovative Tarox B360 10-pot calipers and composite disks, with 330x26 diameter brake rotors, for absolute yet at the same time variable braking power. • The ruby red Marangoni ‘M-Power EvoRed” tyres in 255/30R20 size are fitted on Oz Racing Dakar 8.5x20 rims. The car will make its worldwide debut at the upcoming Motor Show in Bologna, Italy, from 3 to 11 December 2011. Throughout 2012 the Marangoni Evoque HFI-R will also be shown at many main European motoring exhibitions and events. The car will be touring the UK early January. M-Power and the full Marangoni Tyre range are exclusively available throughout the UK at Kwik Fit – the leading fast-fit supplier of tyres. With over 570 Centres in the UK road users are never far from a Kwik Fit centre where their teams – keeping the UK on the road. Marangoni Tyre has a proud history of innovation and design ideas spanning over 50 years. The ‘100% Italian’ tyre manufacturer has become a worldwide point of reference for forward-thinking technological solutions such as: the development of the Ultra High Performance tyre series and special winter models; the design of low rolling resistance and high mileage compounds; and the development of products that reduce fuel consumption and CO2 emissions. For further details about this press release and to request more images please contact Chris Caines at Flipify Media – press@flipifymedia.com or +44 121 288 3547. Additionally, if you would like to discuss test driving the car in January 2012 please contact us. This press release was distributed by ResponseSource Press Release Wire on behalf of Flipify Media Limited in the following categories: Men's Interest, Entertainment & Arts, Leisure & Hobbies, Women's Interest & Beauty, Sport, Consumer Technology, Motoring, Retail & Fashion, Computing & Telecoms, for more information visit https://pressreleasewire.responsesource.com/about.